STEVENS POINT, Wis. (June 25, 2015) -- Friday, June 26, 2015 at 4:30PM The Wisconsin Department of Tourism will present $23,000 in grants to two Stevens Point area organizations. The grant presentation will take place at the Stevens Point Area Convention & Visitors Bureau. The Central Wisconsin/Stevens Point Area Sports Commission is receiving a $15,000 Ready, Set, Go! grant from the Wisconsin Department of Tourism to host the 2015 Carhartt Bassmaster College Series National Championship, July 9-12. The Community Foundation of Central Wisconsin is receiving an $8,500 Joint Effort Marketing (JEM) grant to promote PaddleQuest, August 7-9 and 22. Representatives from the Stevens Point Area Convention & Visitors Bureau, including Executive Director Sara Brish will be in attendance and available for comment during the duration of the event. PaddleQuest event planner Matt Kirsch will also be in attendance and available for comment during the event. Jeff Anderson, Regional Tourism Representative with the Wisconsin Department of Tourism will present the two grant checks. SPACVB Board members, community officials and local media will also be invited and encouraged to attend the event. 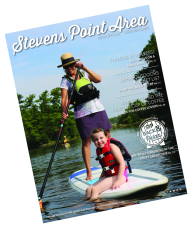 The Stevens Point Area Convention & Visitors Bureau is the official destination marketing organization for the communities within Portage County, and works collaboratively with a diverse mix of organizations, to bring people to the area and to create a positive impact in the communities we serve. The SPACVB focuses on key strengths that drive tourism throughout Portage County in four key markets, including Leisure Travel, Sports, Meeting & Conventions and Groups.